Yet another glitch in the government’s emergency alert systems sent out a cryptic warning to residents living in Salem, Oregon, and surrounding areas. As SHTFplan.com's Mac Slavo details, the head of Oregon’s emergency management agency has since apologized, but that was too little too late after many were left in a state of panic. 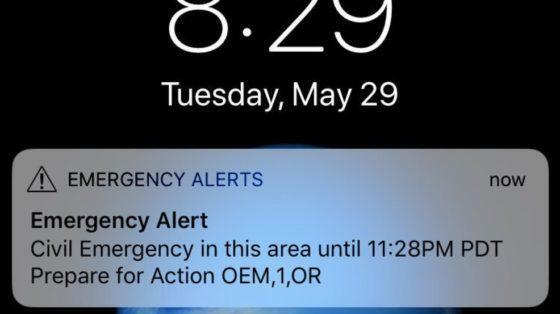 A cryptic emergency alert was forced out to cellphones in and around Oregon’s capital city, displaying the words “Civil Emergency” and “Prepare for Action,” but carrying little other information. Andrew Phelps said late Tuesday that a technical glitch had cut off the crucial information in the alert. There were elevated levels of a natural toxin in a local reservoir. Children and people with compromised immune systems have been told not to drink tap water in the Salem, Oregon, area after an algae bloom caused the spike. “The integrated public alert warning system inadvertently defaulted to a generic message,” Phelps said in a video posted on the social media by the Office of Emergency Management. “It almost made me not want to go outside,” Mahaffey said, adding that the alert caught him at the gym and that he had interrupted his exercise routine to ask the staff at the front desk if they knew what it was about.